If there's one thing that I love about anime it's GIANT ROBOTS!! As I mentioned in a Part One, I've made plenty of 2D floorplans from card and paper in the past and whenever I've painted or covered them they've warped quite considerably. So I approached the decorating of the first tile as an experiment in materials and techniques rather than trying to get any kind of quality or finish. I was surprised to find that the foamcore stands up to painting quite well and doesn't warp much at all. I used some old rowney poster paint to begin with but this had a tendency to dry with a powdery finish so when adding wet layers on top it tended to blend or streak. I switched to some cheap artists acrylics, but these were a bit too gritty in consistency even though they covered reasonably well and suit my painting style which is to blend up from black. My next experiment was with household emulsion. I bought some tester pots from a local DIY store. This made the boards warp when the paint was wet, but they flattened out a bit when they dried. These were painted in two shades of grey, dark then a lighter grey top coat. I then drew on the mortar lines for the brick and cracked floor tiles in pencil, before giving them a black wash. The black wash was repeated in the corners and edges of the door tabs before the bricks were edgelined with a lighter grey. 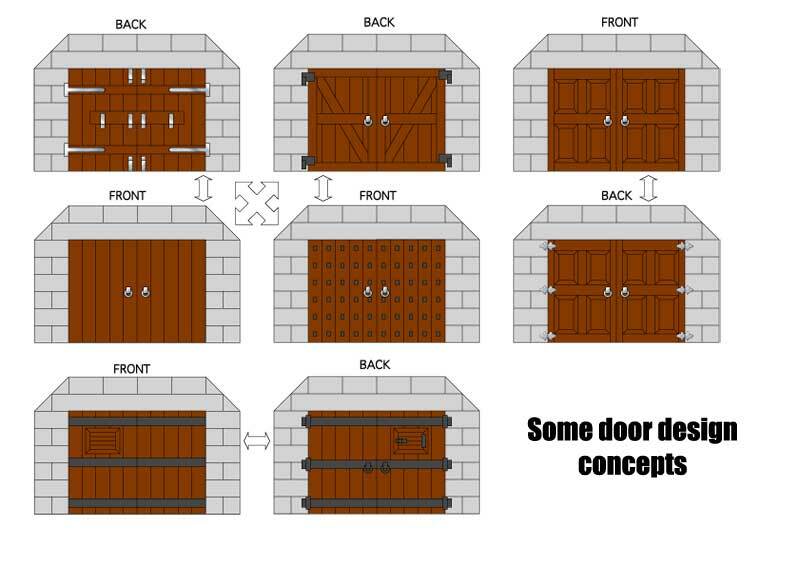 I sketched out a few double door concepts on the computer just to give me an idea of where things like the hardware (hinges, lintels and straps) would go. Brickwork was sketched out and then the whole door was painted in three shades of brown. The lintel was cut out and glued onto the door, then the brickwork was painted in the same fashion as the walls and floors. Once the highlights were done I cut out the hinges and glued them to the door. These were painted in brown and a very dark grey. As I wrote earlier, this was as much about experimenting in materials and techniques so it would be churlish of me to give you the impression that I got it all right first time, but I wasn't a million miles away. The Tower of the Archmage is hosting this month's RPG Blog Carnival which poses the question "What roles have animals played in your games?". Here are some of the ways I've used animals over the years. Animal Companion NPC - Non-magical characters can get in on the supplemental skill action with an animal NPC. Barbarians with tame bears and wolves are not unheard of, Rangers with birds of prey, Elves with dragons etc. They are a common feature in literature, from Samwise Gamgee and his pony "Bill" in The Lord of The Rings to Fitz's bonded wolf "Nighteyes" in Robin Hobb's Farseer Trilogy. Pets - These animals tend to be more of a quirk than anything truly useful, but can be good plot devices for DM's. One of my current campaign PCs rescued a terrapin from the a streetvendor who was barbecueing them as tasty treats. All credit to him as a player he had us in stitches when in the middle of a rather intense discussion over a round of drinks in a tavern, he reached across the game table to retrieve his imaginary terrapin as it tried to escape. Producers - All animal companions have the potential for use as a melee weapon, but there are some animals which can have uses beyond the mundane biting and clawing aspects of combat. How about animals such as the humble goose whose feathers make quills or arrow fletchings, the bear that you must kill in the Northern Wastes in order to make a coat to survive a snow storm. In my current campaign there's an Assassin who keeps a tree frog which produces the poison he dips his darts in. Transport - If you've not run a game where your PCs have bought a lame, stubborn or unrideable horse, or in my case a psychotic spitting camel, then you should even if just for comedic value. Retrieving a loose horse or fending off a bunch of rustlers are also fun sidetreks to relieve the boredom on a journey. I've even created my own Animal Item Cards and Paper Minis to help my players to visualise and manage them. Animal Hybrid PCs - One of my favourite RPGs is Justifiers which has the "Beta-Humanoid" animal hybrid concept at it's heart. These corporate owned constructs are bred for their congenital abilities which make them extremely useful for exploring new planets for natural resources which their corporate masters hope to exploit. I also used the animal hybrid as a concept for Lizardmen in my campaign, complete with a racial schism which over the centuries as meant that a common ancestor evolved into two distinct species Red Salamankari and Green Salamankari but who share many physical and social similarities including a bloodthirsty animosity towards each other. In Part One I discussed the design. 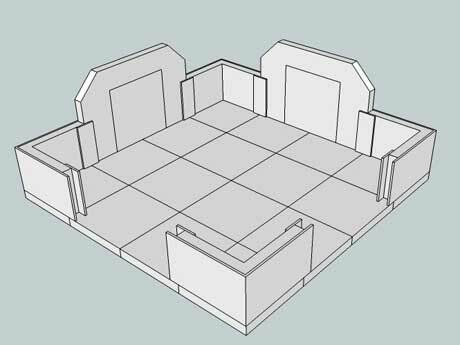 However, I didn't give you any detailed plans with measurements, mostly because I didn't know how accurately I could cut the foamcore. After a bit of trial and error, with different construction methods, I settled on the overlapping laminate design for each corner (as seen in the picture to the right). This means that each tile has an outside measurement of 6" x 6" and they will tesselate quite nicely without any annoying gaps in the floor. The downside to this design is that any opening which doesn't have a door or wall in it has an obvious slot in it's edge. 1 x Base (5mm Foamcore) - 6" x 6"
4 x Long Corner (2mm card) - 43mm x 1"
4 x Short Corner (2mm card) - 41mm x 1"
4 x Long Corner (5mm Foamcore) - 36mm x 1"
4 x Short Corner (5mm Foamcore) - 31mm x 1"
8 x Tabs (2mm card) - 10mm, 1"
Don't worry too much about getting it absolutely accurate to the mm as the foamcore is quite forgiving. The card on the otherhand needs to be quite accurate as this is going to provide your overhang and ultimately a slot into which you can slide your door or wall sections. All the corner sections are glued up with PVA (or Elmers) as in the picture above. I used masking tape to bind the corner whilst I finageled in the foamcore, again the foamcore is quite forgiving so if the corners fold out, don't worry too much as the foamcore will compress back to 90 degrees when you glue each corner onto the base. It's a good idea at this point to draw over the pencil lines on the base with a ballpoint pen, otherwise it'll be trick to get a straight edge in the confined space once you've glued on your corners. My trial and error provided me with several abortive boards with good square corners, so I just used one as a jig. 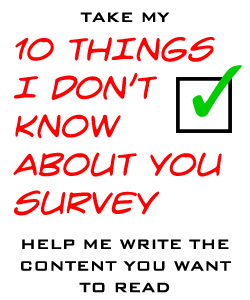 This was invaluable and I would recommend making one. The corners are then hot glued onto the base. This is a bit of a messy job, but hot glue is way stronger than the foamcore's paper backing and provides a great bond. Once all 4 corners have been glued onto the base, take some time to trim off any excess glue particularly around the join between the base and the overhanging card which forms one of the inside faces of the door/wall slot. If there's any splodges of hotglue in the slot it will prevent your door or walls from sliding all the way to the bottom. Then you just need to cut some 10mm x 1" tabs and hot glue to the opposite faces of the foamcore at both ends of each corner. It took me a while to develop a technique of sliding the tabs towards the open end to get them into the correct position to prevent any hot glue seeping into the slot. Once this is done the doors and walls can be cut from foamcore. 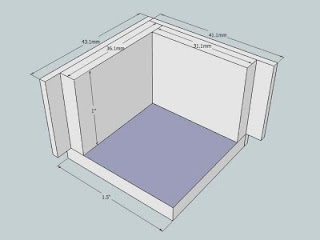 Doors are 3" x 2" and walls are 3" x 1", but can be trimmed down if they don't quite fit into the two slots at either side of an opening. This gives you the option of having a door or a wall in each side. Just cut more doors and walls as you need. Eh Voila, three 20ft square dungeon rooms. In my next part I'll be tackling the painting and decorating. One of the aspects of Roleplaying that I've always loved is the craft element, be it painting miniatures or making maps, it satisfies the modeller in me. In particular I've always wanted to have an impressive 3D dungeon setup, so when I stumbled upon Eredrian's Warhammer Quest Tiles I decided that I'd give it a go. I've designed and built plenty of 2D tiles before, but never in 3D with walls and doors. The biggest change has been to scale everything up to a 1.5" grid as a 1" grid became too cramped and play broke down. Another inspiration was the fantastic drakkon boardgame which has a couple of fun actions like the Rotate a Room and Floating Room which I thought would be nice to have in a dungeon. This all percolated into an embryonic design of a 6" square standard tile with a 4x4 grid 1 inch high walls with removable wall/door/feature sections which I drew out in sketchup. In Part Two I'll be pulling out the foamcore and starting to cut.